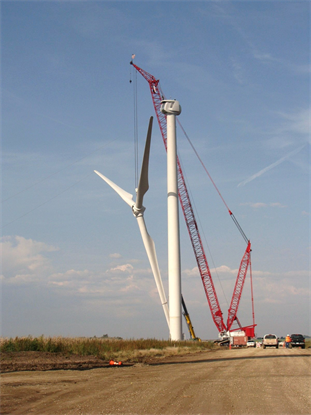 OlsenBeal specializes in Wind Turbine Generator installation including tower, nacelle, and rotor erection. 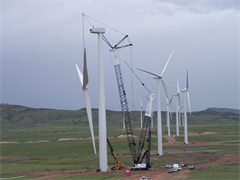 Our roots in the wind turbine installation industry began in 1999 with a small project in Wyoming for SeaWest (now AES). Since that time, we have erected over 1,000 WTGs throughout the western half of the United States. 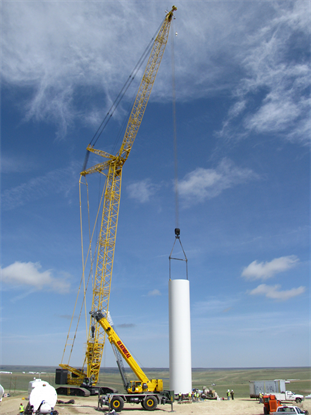 OlsenBeal has experience with erecting a large variety of WTG manufacturers turbines. We have exeptional crews with vast knowledge in installation of these turbines. This has proven to be an asset to our clients and our clients clients. We strive to make sure that both OlsenBeal and our clients receive repeat business because expectations are met and exceeded throughout the project. OlsenBeal owns several large capacity crawler cranes including our newest addition - the Kobelco SL6000 (600-ton capacity) crawler. This crane will set all current multi-megawatt wind turbines. Contact us for an estimate on your upcoming project. OlsenBeal has been erecting Steel bridges since 1987. Since our beginnings as a company, OlsenBeal has always looked for the safest and best way to erect bridges. In 1989, we erected the Eagle Canyon arch bridge in Southern Utah. This arch bridge challenged our erecting crew, as we did not have access to the canyon floor. We came up with a suspended hold back tower system as a remedy. OlsenBeal finished with the Utah I-15 Reconstruction Project in April of 2001. In 1997, we combined with four steel fabricators and one detailing firm to form the I-15 Steel Structures, LLC. Over the next four years, we erected 65,000-tons of steel and over 175,000 lineal feet of pre-cast girders for a combined total of154 bridges. Being the sole erector for this project was a daunting responsibility, but OlsenBeal was up to the challenge. We finished the erection of all bridges on time or, in most cases, ahead of schedule. We met and exceeded expectations in our role for completing this major highway expansion. OLSENBEAL received the NSBA steel bridges special project award for our part in the I-15 reconstruction project. In June of 2001, OlsenBeal completed another challenging project - the construction of a steel plate girder bridge that spanned across the CC&V gold mine canyon - located in Victor, Colorado. One major obstacle on this project was crane access. Due to the steep sloping, rocky sides of the canyon, we were limited in the locations for our crane pads. Canyon winds and weather conditions also made this project a challenge, but we were able to erect it on time and remain within budget. This bridge is the tallest steel plate girder bridge in Colorado. At its tallest point, this bridge is elevated 250’ off the ground, it is over 1,200 feet inlength, and weighs approximately 2,436,000 lbs. (steel). 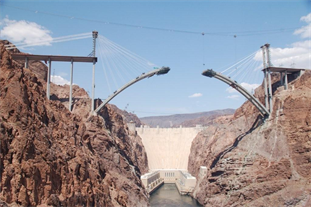 In the fall of 2005, we were asked by Obayashi Corp to participate in the erecting of the Hoover Dam Bypass bridge. 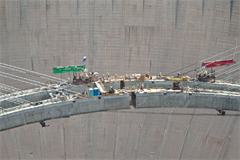 Our responsibilities included the assembly / disaasembly of the twin cable way towers that would be used to transport all materials over the canyon to the work site, the installation of all precast columns, the erection of the steel tub girders and general assistance with the arch erection. This project is set to be completed in the Fall of 2010. It will be the 4th largest Concrete Arch Bridge in the world. We also have certified riggers to complete your heavy lift projects, eliminating the need to worry about lift coordination between different contractors. As we are an AISC Certified Advanced Steel Erector, we maintain high levels of quality, efficiency, and most important, safety standards. OlsenBeal specializes in the transportation of heavy machinery, rigging, and trans-load projects. The large fleet of trucks and trailers that we use to move our own equipment, including our Kobelco SL6000 and Manitowoc 2250 crawler cranes, has proved to be equally adept at transporting heavy equipment and machinery for our clients. OlsenBeal recently expanded into Wyoming with the purchase of a satelite office located in Central Wyoming. We will maintain some of our equipment and manpower at this new location.